For this card, I let the Delightful Daisy DSP from Stampin' Up be the star of the show! I matted the DSP onto a piece of Wisteria Wonder cardstock cut using the largest die from the Fancy Scalloped Rectangle Stackables by Lawn Fawn. I then layered that onto the card base of So Saffron colored cardstock. Finished card is 4-1/4 x 5-1/2 inches. I combined several different stamps for this card. I love doing this! I used the "happy" from one stamp and the "birthday" from another. When I was going through my stamps the other day, I came across a retired Stampin' Up stamp set called Send a Celebration from 2006. I hadn't used this set very much, so it was more or less a "new find" for me! I liked how the daisies in the stamp coordinated with the daisies in the DSP. 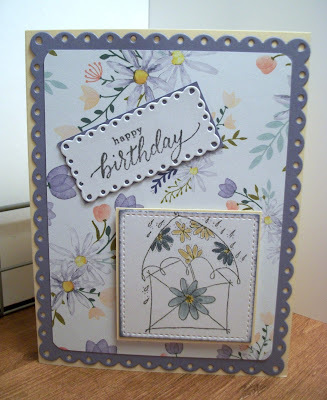 I stamped it in black and then colored the flowers using the Wisteria Wonder and So Saffron Stampin' Write Markers. I cut it out using the Stampin Up Stitched Framelits and then added that onto a piece of So Saffron cardstock cut just a big larger. 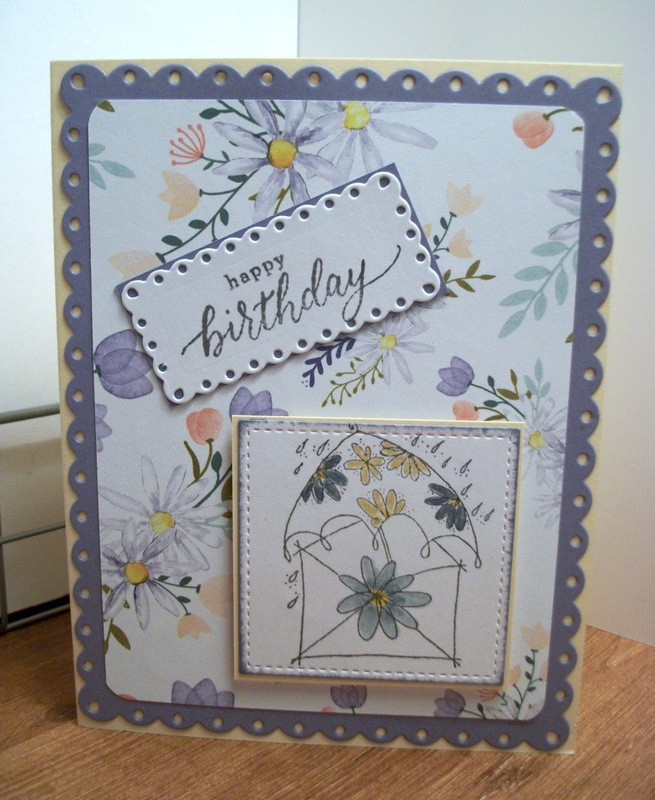 The birthday greeting is die cut from the same Fancy Scalloped Rectangle Stackables by Lawn Fawn that I used to cut the larger scalloped layer on the card, and then layered onto a piece of Wisteria Wonder cardstock cut just a bit larger. Stamp sets used for the greeting were Simply Stated by Catherine Pooler Designs and Endless Birthday Wishes by Stampin' Up.